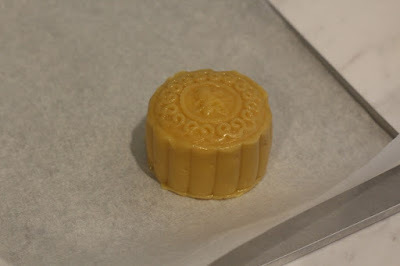 This was one of the mooncake recipe that i didn't expect to be nice, so i made a small batch. But it turned out nice and less sweet. The pastry turned soft very fast, only took overnight to become soft. Anyway it was quite difficult to handle the soft custard filling while shaping. Hopefully i can improve this recipe if i make again next year ^_^. 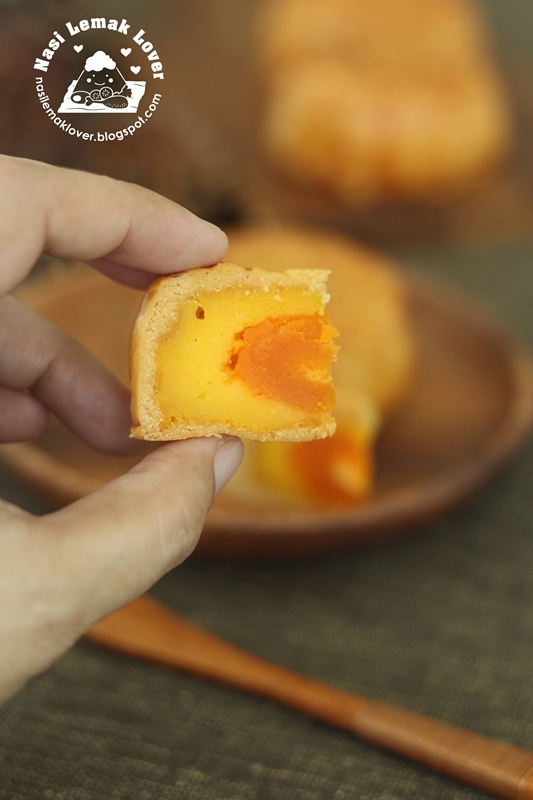 Soft pastry, less sweet custard and salted egg yolks, one of the mooncake that i will bake every year! 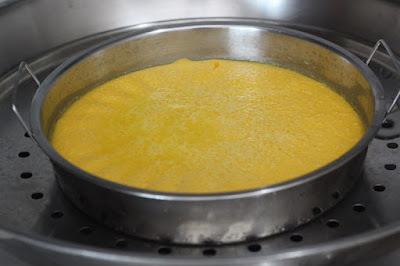 Mix custard powder, milk powder, sugar in a mixing bowl. 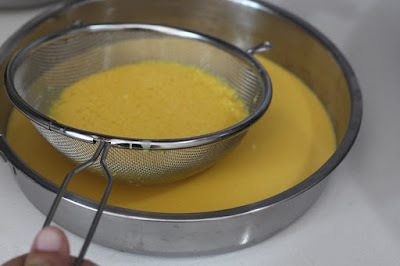 Add in coconut milk, condensed milk, butter and eggs. Stir to combine well. Sift the batter. Pour the batter in a shallow plate, steam over high heat for 8mins. Let the custard to cool down a bit, use a processor to process till fine. Then mix and knead till form a dough. Set aside. Divide the custard dough and add one egg yolk to become 90g each, lightly shape to ball. Set aside. 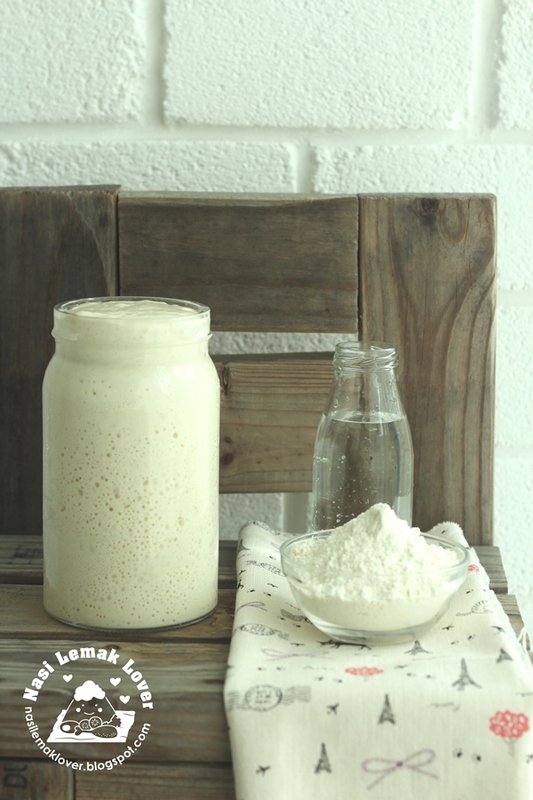 Mix flour, syrup, butter and alkaline water till form a dough. Set aside to rest for 2hrs. 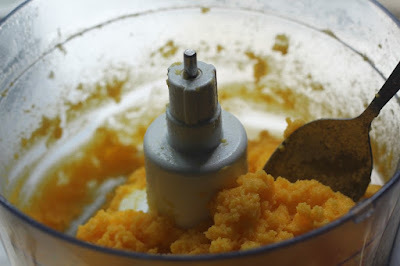 Divide the dough into 45g each, shape to ball. 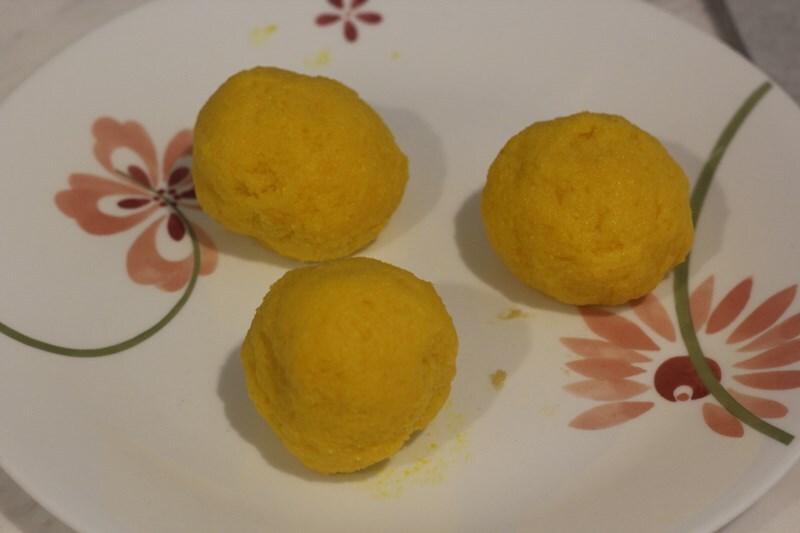 Flatten the dough ball into round disc, place a custard ball in the middle, seal and roll into round. 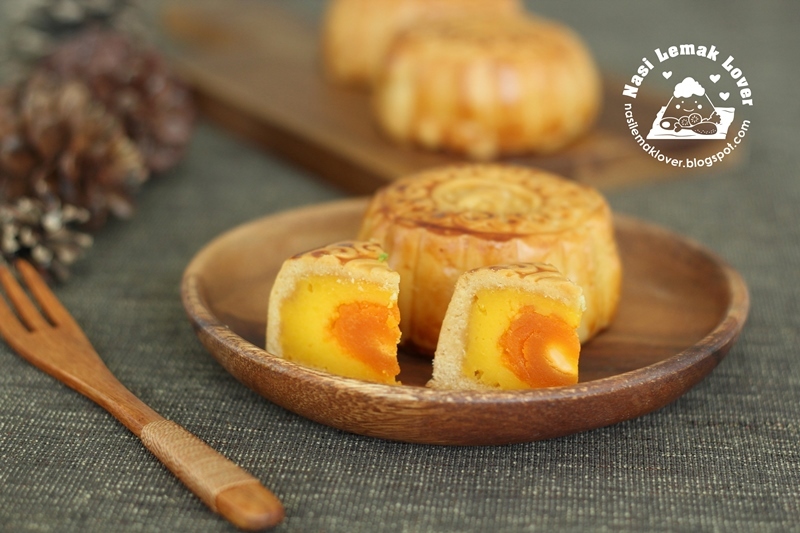 Place the mooncake on a plastic mould, lightly flatten, then knock out. .
Bake at a pre-heated oven at 180C for 5mins, removed from oven and rest it for 15mins. 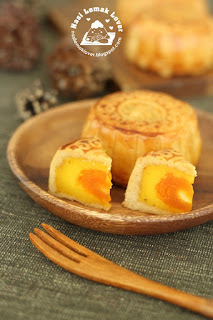 Apply egg wash on the whole mooncake. Reduce temp to 170C and continue to bake for 15-20mins or until golden brown. 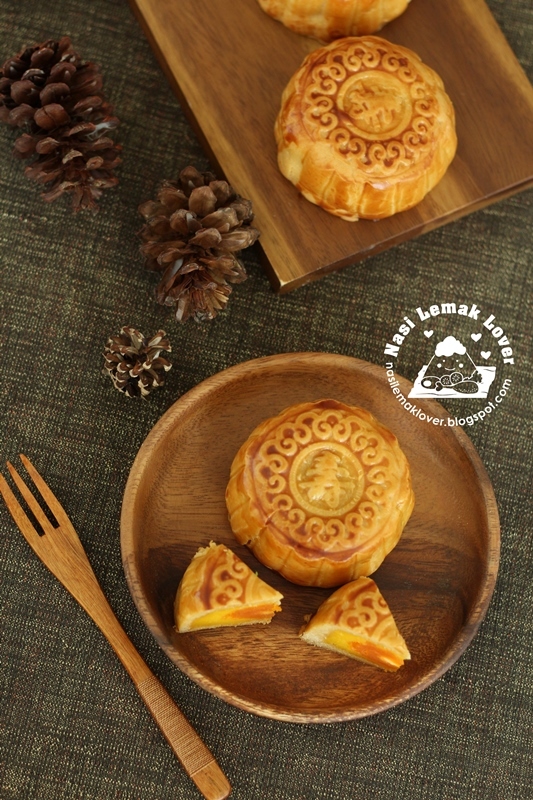 I haven't tried making baked mooncake yet , maybe I'll try it next year :D It certainly looks wonderful ! 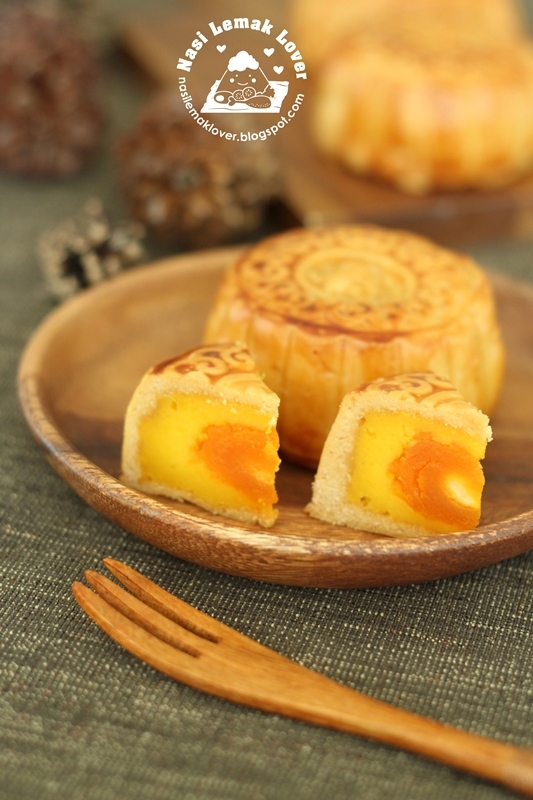 Happy Mid-Autumn Festival , Sonia !!!! 1st baked d mooncake n follow exactly in d recipe and the skin become hard instead soft skin after few days in d air tight container. Is it because of cold weather in australia. Pls adv. Beth. hi, realise that all the follower posts are disappeared. Just check whether this is the intention?